When we have company over either for dinner, drinks, or both I always have to make something for us to munch on. i am HUGE with garlic and consider myself the garlic queen because I put it in just about anything and everything I make! Sad I know, but super yummy! Anyways one of my good friends Jake and I have always competed over who makes the best brushetta and after he held the title for quite a while I made my come back! It all started when I dragged Mikey out to Enrico’s Brick Oven Pizza one afternoon for a late lunch and we ordered their own brushetta. Well lo and behold when our waitress brought it over it was the most amazing brushetta I have ever had!!!!! It had this brown syrupy glaze on it that I couldn’t pin point until we had just about demolished it! Long story short, it didn’t take long for me to perfect it! Mind you Enrico’s serves their brushetta on top of a flat bread cheesy garlic bread which I do occasionally but even keeping it simply like this recipe is just as yummy! On a cutting board mince your basil as well as your garlic and combine in a medium-sized bowl. Once that is done mix it well with 1 Tbsp. olive oil so the garlic and the basil flavor the oil. mince your red onion and combine it well with the olive oil mixture. Core and dice the tomatoes then discard the juices left over from them so it doesnt make the bruchetta watery and your bread soggy. Combine the tomatoes with the olive oil mixture and season to taste with salt and pepper. Once that is done, take a small sauce pan and heat the balsamic and sugar over medium high heat while whisking continuously for 5 minutes or until it has a syrupy consistency. It is important to keep whisking while it is on the burner so the balsamic and sugar do not burn. Once it has the right consistency, set aside. Turn your oven broiler on high and arrange bread on a cookie sheet. Drizzle olive oil over the bread and broil for 2-3 minutes or until toasted. Once bread is toasted arrange them on a serving platter and top with a heaping table-spoon of the brushetta. Sprinkle grated parmesan & asiago cheese on top then using the whisk drizzle your balsamic glaze over each slice! i’ve seen this but i cant’t point where i did. I am sad I didnt learn about this earlier! If you have not had it before you should really taste it! 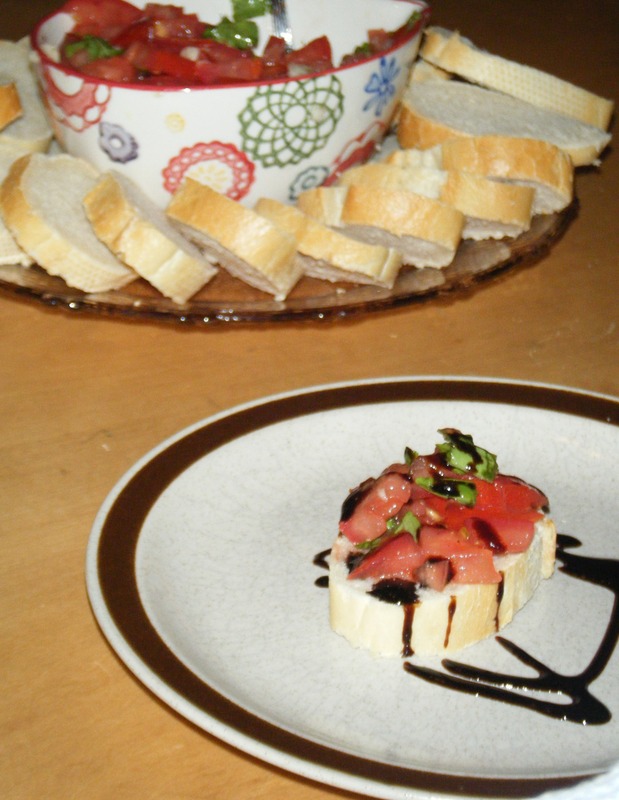 I am sure there are other ways to make the balsamic drizzle but the is the most basic one that I came across.